We’re a big fan of data-driven insights. So when Google announced last week that it had updated its Trends tool to deliver cleaner data sets in real-time, our geek levels reached an all time high. For those readers who are not data-junkies, Google Trends is a free tool that allows anyone to collect insights about trending stories around the web. With Google Trends, you can search for a specific topic and see when that topic receives the most interest, according to search query data. You can also filter data sets geographically, to narrow down trending topics according to region. Although this technology has always been useful, it has also always been somewhat limited due to the fact that Trend data wasn’t available immediately. Depending on the popularity of your chosen topic in your chosen particular region, you might only see data over large periods of time, such as weeks, months, or years. Google’s newest update is exciting because users can now see trending data within hours, or even minutes! How Does This Impact Online Apartment Marketing Strategies? Knowing exactly when user interest peaks for certain topics is invaluable for online marketing, especially when you can do so on a minute by minute basis. In the past, we could put more efforts into our marketing strategies in the months when apartment-related queries were highest. With the newest Trends features, we can concentrate our efforts not only on the months when apartment-related queries are highest, but also the days and hours. As an example, let’s take a look at the keyword query “Apartments for rent” and filter our results to focus on the Philadelphia region. A quick search reveals that this particular query gains the highest interest in the summer months, specifically in late June. This makes sense, as Philadelphia has a ton of colleges and many college-area leases tend to be based around semesters. But thanks to the latest Google Trends update, we can now break this data down by hours, revealing a more precise time frame for user interest. 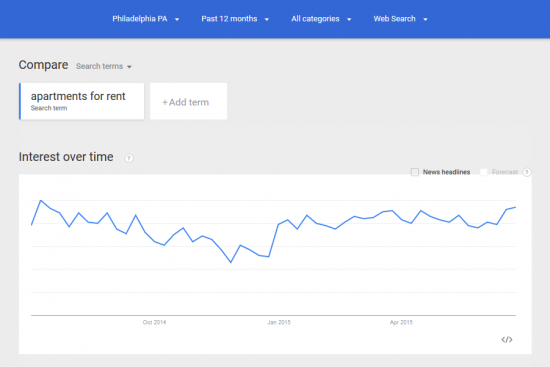 From June 21st to June 24th, for example, the “apartments for rent” keyword was most searched in the Philadelphia region between 6:30 PM and 10:30 PM. Now that we know when potential lessees are most likely to conduct their apartment search, we can use other tools to advertise our properties during those specific times. For example, property marketers using Google’s Display Network would be wise to use this information to create intelligent Ad Scheduling strategies for their campaigns. Creative marketers could also use this information to pump more oomph into their social media efforts. Even if you’re not as big of a data-fanatic as we are at Respage, this newest update has opened up a world of opportunities when it comes to securing leads at higher ROIs. And that’s something that should send everyone’s geek levels through the roof.